The tall peak is visible in all directions. Mt. Whitney is the tallest peak in the lower 48-states, standing at an elevation of 14,497 feet. Located in the Sierra Nevada Mountain Range in California, Mt. Whitney attracts peak-baggers from around the country. Advanced hikers will complete the climb in a single day but most people require 2 or 3 days to finish the trail. The total distance is nearly 22-miles round-trip with over 6,000 feet of elevation gain. The hike itself is not technical during the snow-free summer months. Train for Mt. Whitney by hiking on a weekly basis. Hiking is a muscle specific activity and you must train those muscles before attempting the mountain. Hike the steepest inclines and declines available in your area to prepare for the elevation gain and loss on Mt. Whitney. Find uneven terrain with rocks and loose dirt to prepare for the trail conditions. Do at least two hikes each week for two months leading up to your trip. Do distances ranging from 2 to 10 miles. You must be capable of hiking 8 to 10 miles in a single day. Cross train by jogging, biking and doing physical sports or labor. Cross training builds aerobic endurance without over-training your hiking specific muscles. Workout for roughly one hour, three times per week on top of your weekly hikes. Focus on controlling your breathing during physical activity. Breathing is critical to dealing with the high altitudes found on Mt. Whitney. 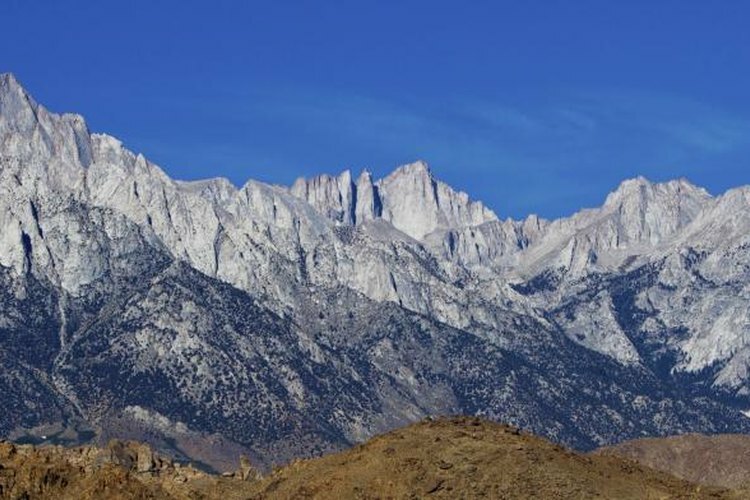 Oxygen loss is the most challenging aspect of climbing Mount Whitney. Altitude sickness is common and causes many hikers to turn around without reaching the summit. Boost your ability to handle low oxygen levels through intensive training. Complete intense sprint workouts to deprive your muscles of oxygen. Also integrate bursts of sprints into your jogging and biking routine. Focus on breathing deep during difficult periods of exercise and your body will learn to distribute oxygen and function under pressure. Acclimation is not an option for everyone but it makes a world of difference. Arrive at Mt. Whitney at least 3-days before your climb. Arrive more than a week ahead of schedule if possible. Hike the local trails ranging from 9,000 to 13,000 feet for several days. Do short hikes of 5 miles or less. The time spent at high elevations acclimates your body and reduces the risk of altitude sickness. Maintain a high level of hydration during the training period and load up on water before you push to the highest altitudes of the hike. Your ability to carry water will reduce the effects of altitude and prevent dizziness on the trail. Drink slowly to prevent a stomach ache but drink often to keep your muscles hydrated. Zach Lazzari is a freelance outdoor writer specializing in hunting, fly fishing and the general outdoors. He guided fly fishing trips for 10 years in Colorado, Alaska, Montana and Patagonia-Chile. Zach lives in Montana and splits time between the river and keyboard.